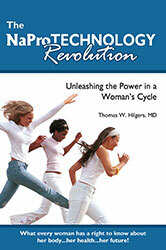 The NaProTechnology Revolution: Unleashing the Power in a Woman's Cycle is a new book by Dr. Thomas W. Hilgers that was released September 2010 by Beaufort Books. It is a book for all women! It contains full-color examples of real women's charts to help women understand the impact that NaProTechnology can have on their health and their lives. The book also contains points to assist doctors in treating women and testimonials of women who have been treated with NaProTechnology. It is what every woman has a right to know about her body … her health … her future! Dr. Thomas W. Hilgers draws on decades of medical experience to provide educational and revolutionary insights into the world of women's health. The NaPro Technology Revolution provides real solutions to real problems such as infertility, repetitive miscarriage, menstrual cramps, postpartum depression, PMS, prematurity prevention, ovarian cysts, hormonal abnormalities, irregular/abnormal bleeding, chronic discharges, polycystic ovarian disease, and family planning. Hilgers sheds light on abnormal ovarian function, an issue that millions of women unknowingly suffer from. His methods have proven to assist infertile couples nearly three times more successfully than those who use in vitro fertilization, without the dangers of early abortions, frozen embryos, or high rates of multiple pregnancy. The NaProTechnology Prematurity Prevention Program cuts the rate from the national 12.7% to 7%. The NaPro Technology Revolution has real solutions to real problems! Thomas W. Hilgers, MD, is the founder and director of the Pope Paul VI Institute for the Study of Human Reproduction (located in Omaha, Nebraska and home of its National Center for Women's Health), where he is also the senio medical consultant in obstetrics, gynecology, and reproductive medicine and surgery. Dr. Hilgers is a clinical professor in the Department of Obstetrics and Gynecology at Creighton University School of Medicine. He is a diplomate of the American Board of Obstetrics and Gynecology (1976) and the American Board of Laser Surgery (1988) and is a member of the prestigious Society of Reproductive Surgeons. Dr. Hilgers has served on the Pontfical Council for the Family and is an active member of the Pontifical Acadmey for Life. He has written over 200 professional books , book chapters, and research articles (mostly in the areas of reproductive medicine and surgery) and he has produced videotapes, poster sessions, and audio recordings. Since the time of his first research in the natural regulation of human fertility in 1968 as a senior medical consultant, he co-developed the Creighton Model FertilityCareTM System, along with K. Diane Daly, RN, CFCE; Susan K. Hilgers, BA, CFCE; and Ann M. Prebil, RN, CFCE. Dr. Hilgers' ongoing research on the Creighton Model System enabled him to develop the new women's health science of NaProTechnology.